If you're traveling to Nashville for vacation and don't mind a bit of a drive, there are a number of great adventures within a few hours of the Music City that are perfect for a family day trip. Although Nashville has plenty to offer guests including the Parthenon, the Country Music Hall of Fame, Centennial Park, the Grand Ole Opry, and the Johnny Cash Museum, there's nothing like a quick trip out of the city to spice up your family vacation. From dude ranches to waterfalls, trout fishing to cave spelunking, the following day trips offer visitors hours of family-friendly entertainment all within the state of Tennessee and often for a fraction of the cost of Nashville's popular tourist attractions. Less than one hour west of Nashville, Bucksnort Trout Ranch is located off exit 152 on I-40. Bucksnort is the perfect introduction to fishing for all, but children will especially love the experience of baiting their own lines and reeling in the day's big catch. As an added bonus, there is no finer meal in Nashville than a fresh Rainbow Trout, which you can catch and cook all on your own or have the folks at Bucksnort prepare it for you. Located 60 miles north of Nashville in Montgomery County, Dunbar Cave State Park offers a wonderful 8-mile long cave along with a fishing and picnic area along Swan Lake and several hiking trails in the surrounding mountains. Although the park no longer holds square dances, radio shows, and big band concerts in the mouth of the cave like they once did, there is still a great lineup of summer programming each year available on the park's website. Fall Creek Falls State Park encompasses more than 20,000 acres along the eastern top of the rugged Cumberland Plateau and offers several gorgeous waterfalls and plenty of outdoor activities. Known as Tennessee's largest and most visited park, this park features a number of pristine waterfalls including the 256-foot tall Fall Creek Falls. Historic Downtown Franklin, located in the heart of Williamson County, is just a mere 30-minute drive from Nashville. The Downtown Franklin District is filled to the brim with plenty of quaint antique shops, cute little boutiques, and delicious restaurants as well as offering its visitors a ton of Tennessee History to explore. Jack Daniel Distillery is located in the 371-population town of Lynchburg, just 70 miles southeast of Nashville. The town of Lynchburg, as well as the distillery, is a very enjoyable way to spend a slow southern Tennessee day, and although kids won't be able to enjoy the tasting room at the distillery, they might enjoy seeing how one of America's favorite whiskeys is made. Land Between the Lakes is a 170,000-acre national recreation area in Western Kentucky located just off I-24, about 90 miles north of Nashville. LBL offers everything from an Elk and Bison Prairie to a Planetarium as well as the Kentucky Dam, Fort Donelson National Battlefield, and access to the Venture River Water Park. Lookout Mountain sits just north of Chattanooga and features a number of popular tourist attractions like Ruby Falls and Rock City—which are advertised on billboards all over the state. Other great activities include zip line tours, guided journeys into America's deepest cave, and stunning vistas of seven states at once. Located just off I-40 at exit 143 is the town of Hurricane Mills, Loretta Lynn's Dude Ranch is an entire town that was purchased by Lynn and her husband Mooney in the mid-1960's. With its' own gristmill, post office, general store, and campground, this amusement park and village make for a great family outing that's just over an hour's drive from Nashville. 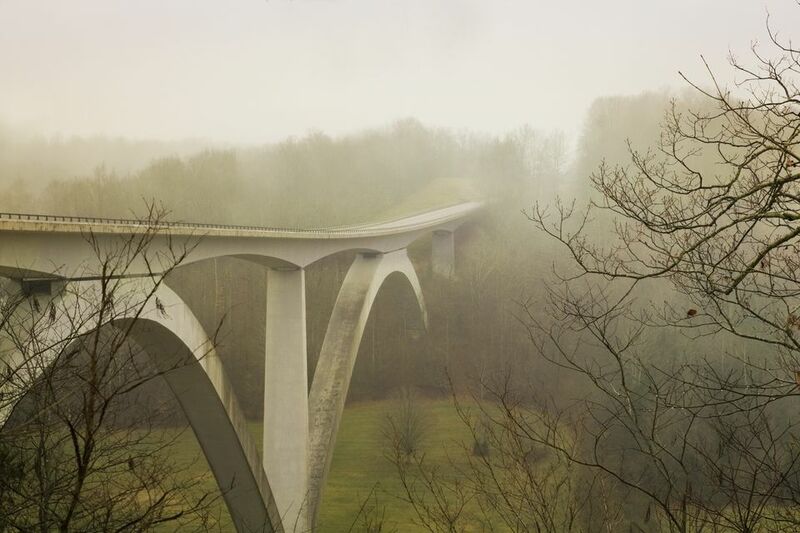 Natchez Trace Parkway celebrates an ancient trail that stretched over 444 miles from Mississippi through the northern tip of Alabama and into Tennessee. Now, you can drive or bike through this scenic byway or stop along the way for hiking, horseback riding, camping, and more.